While ultrabook manufacturers continue to cut corners in order to meet the sub-$1000 price point, Acer may be ahead of the game with its upcoming Aspire S3 ultrabook. According to CRN, electronics retailer New Age Electronics is currently listing the Acer ultrabook for $899.99. The sub-$900 has reportedly been confirmed by a spokesperson from Synnex on Tuesday. Such a low price point could even encourage competing ultrabooks to reduce their launch prices as well. “The low price sends a clear signal that Acer intends to compete with Asus for the opening price point,” said analyst Deron Kershaw at Gap Intelligence. The Lenovo ultrabook, for example, will be launching later this year with impressive specs, but will start at $1200. Acer, however, refused to confirm of the $899 list price. “We do not confirm this price and will not disclose local configurations or pricing until it becomes available locally,” said Acer in an e-mail by CRN. Oddly enough, the notebook was spotted on a different online retailer for 786.19 Euros (1130 USD) earlier this month. Whether the configurations between the listed models are the same, or are simply just placeholder prices, remain to be seen. 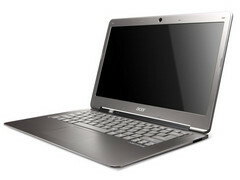 The Acer ultrabook was first leaked early August and then officially revealed as the Aspire S3 at IFA 2011. CRN claims an official release within the next two weeks.